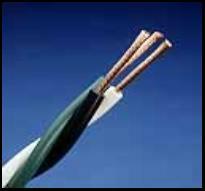 Above listed fixture wires, twisted in to two or three or four conductor assembly, no jacket. Any combination in color code chart 1A. ** UL Listed TFN/TFFN may not show temperature ratings or voltages, other than 600V, on the surface print of the wire. Surface print may list the corresponding AWM style numbers. Reel tags will note appropriate AWM temperature and voltage ratings and additional appliance wire usages.